This project is supported by a grant from the William Penn Foundation and the Philadelphia Exhibitions Initiative, a program funded by The Pew Charitable Trusts, and administered by The University of the Arts, Philadelphia. Additional start-up funding was provided by individual private donors. Includes links to information about the exhibitions at member websites where available. "Leaves of Gold: Treasures of Manuscript Illumination from Philadelphia Libraries." "Books, Printers, and the Information Revolution in Early Modern Europe." An exhibition of 15th and 16th century books and manuscripts. "Other Leaves: Medieval and Renaissance Manuscripts from the John Frederick Lewis Collection." On display are the great range of manuscripts collected by John Frederick Lewis---not only beautiful Bibles and Books of Hours like those seen in Leaves of Gold, but also chronicles, almanacs, songbooks, philosophical works, and more. "Leaves of Color: Artists and Storytellers." Highlighting the craft and imagination of binders and illustrators, chroniclers and typesetters, bindings and pictures celebrate the colorful and sensual world of the book-as-artifact that is reflected in the work of such creators as Maxfield Parrish, Lewis Carroll, Winslow Homer, Violet Oakley, and Joan Miró. "Foundations of the Faith." Offered as both continuation and counterpoint to Leaves of Gold, this exhibition features printed texts from the 1520s to the 1670s documenting Reformed traditions with works by Zwingli and Calvin. 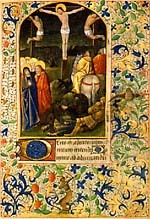 "Outre d'Amour pour Amour Morte"
An Allegorical Love Poem of the 15th Century by Burgundian court poet Georges Chastelain, with four miniatures. Incunabula from the Seminary's collection. "The Manuscript Tradition." Materials, styles, and traditions of European and Eastern manuscripts, from cuneiform tablets and papyri through 15th century vellum codices. "Specula: Mirrors of Man and Nature: Manuscripts from the Collection of Lawrence J. Schoenberg." The exhibit includes manuscripts from the 9th through the 17th century and shows the ways in which classical and Arab texts were transmitted to the West. The manuscripts are beautifully illustrated and part of an extensive private collection. Lecture by Paul Saenger of Newberry Library, 26 March, 5:30 p.m.
See current listing of PACSCL member exhibitions . "When Books Were Rare and Beautiful"
Course, "Precious Pages: Manuscripts, East and West"
Saturdays, March 10, 17, 24, and 31, 2001, 1:30-3:45 p.m.
Sundays, April 1, 8, 22 & 29, and May 6 & 20, 1:30--3:30 p.m.
Join teen docents in the Leaves of Gold exhibition to see the tools and learn the craft of manuscript illumination and book making. Class size is limited, and reservations are required for each workshop. Tickets are available in the Museum's West Entrance Hall or by phone, for an additional fee, at (215) 235-SHOW (7469). April 1, 2001 -- 11:30 a.m. & 1:30 p.m.
Saturday, April 21, 9:30 a.m. - 2:00 p.m.
10:00 a.m.-3:00 p.m. Celebrate Medieval Times!